Denton and Reddish MP, Andrew Gwynne, has demanded action from central government as new research has revealed that five times more working class jobs are at risk from automation than were lost in the entire coal and steel industries of throughout the 1980s. The research, which draws on OECD data and new analysis from the House of Commons library, states that while new jobs will be created, job losses will overwhelmingly impact on working class occupations. Research from the House of Commons Library show that 2,088 manufacturing jobs are at risk in Denton and Reddish, with over 900 in the wholesale sector and over 200 in the automotive industry. 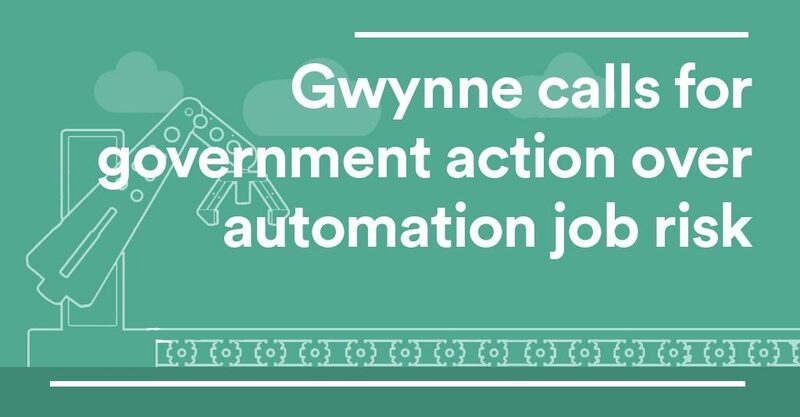 New exclusive opinion polling from insight agency Opinium also shows that a quarter of people think the government isn’t doing enough in response to automation, with 7 in 10 saying they believe the government should provide resources to help those who lose their job as a result. Five times more working class jobs are expected to be lost through automation than were lost in the running down of the coal and steel industries in the 1980s. Between 2.1 million and 2.9 million working class jobs are forecast to be lost, overwhelmingly in working class occupations in retail, transportation and routine manufacturing. House of Commons Library analysis of OECD figures shows 1,024,000 jobs are expected to be lost amongst amongst the poorest 10% of UK workers, earning under £7.64/ hour) – that’s 32% of all low pay jobs. Amongst the bottom 25% of the job market, where workers earn less than £9 an hour, 2,128,000 jobs are at high risk of automation – that’s about a quarter of low paid jobs. By contrast, virtually no jobs are forecast to be lost amongst higher income groups. The Red Shift analysis indicates that Tory seats in England will be hit harder than Labour seats, which suggests that there is a potential prize for Labour if it can offer a better way of dealing with automation than the Conservatives: 4.08 million jobs may be lost in Tory seats in England (around 30.7% of jobs in every seat), compared to 3.45 million jobs English Labour seats (around 30.3% of jobs in every seat). New exclusive opinion polling from research firm Opinium suggests that people are worried about the impact of automation and want government to do more to help those whose working lives are affected by it. Almost seven in ten people (69%) think the government should provide money for retraining if someone loses their job due to automation. A quarter (27%) of people think the government is doing too little in response to automation in the workplace – although this rises to 35% in the North West and 29% in the South East. Half of respondents think that increasing automation in the workplace will make it harder for them to earn a decent wage, or find a new job in the future. Working class voters are more likely to say that automation will make it harder to earn a decent wage in the future (54% of C2DE vs 46% of ABC1). “These figures are very worrying and show that the Government have to wake up to the threat posed by automation to ordinary working class jobs – of course there are benefits to automation, but risks too.